About this time last year, I published a design plan for this same client. It was for her game room. That project has been completed, and we’ve now moved on to another room: her home office. When we get this one done, I’ll get my photographer in there to shoot both rooms for some great “after” pics. Until then, because it’s the week of July 4th, I thought I’d share the design plan for this charming space that's done in red, white, and blue! Even though she will have a nice work surface built in along the wall, I thought having a work table in the room would be useful for her. 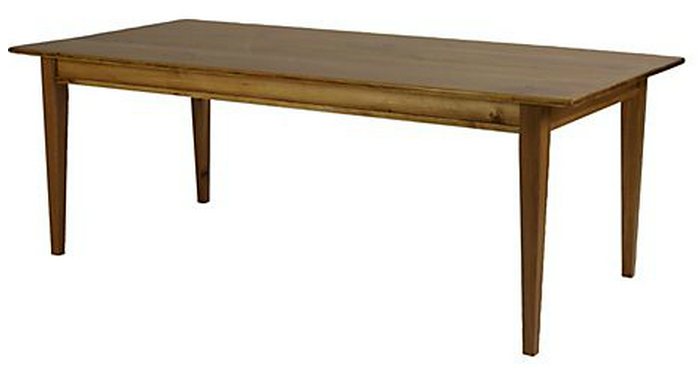 She could do paperwork, wrap gifts, do crafts, help kids with homework ... anything on a simple, antique wood table. In a 36” x 72” size. You know, like a table desk. Something simple and multi-functional that can take anything. Right - Desk chair, fully upholstered to soften the space and add some fabric with major color (below). Right - Visually, the window treatments make up a large portion of the space, so I chose a Ralph Lauren fabric with a big hit of blue, along with some textural, woven wood shades. Left - These stools, in a warm caramel leather, will be great for adding extra seating at the table. Don't you think they have such a warm, homespun feel! Here's a nice slipcovered lounge chair and ottoman, placed in the corner, with a solid neutral linen, as well as a darling pillow in one of my favorite patterns: houndstooth. Right - Here's a cute red wicker table that's set beside the chair. And that's it. Our furnishings are complete! If I put wood flooring in the hallways adjacent to this space, I would normally bring that floor into this room as well. It had to be something that would stand on its own, indefinitely, even after the next remodel, so I chose seagrass. It’s just right for the New England/coastal type style this home exudes and works perfectly for our needs. As for the built-ins, we kept them. And we changed out the painted countertop for a stained wood one - it will be the primary work surface. Fresh paint, new countertop, and seagrass all installed. It’s looking good! I can’t wait to see this one installed!